Scramble To Move People, Packages In Colo. Hundreds of flights left Denver's beleaguered airport on Christmas Eve with many passengers who had been stranded when a two-day blizzard shut down the runways last week. Meanwhile, the Postal Service was deploying an unprecedented effort across Colorado and Wyoming on Christmas Eve to try and get hundreds of thousands of blizzard-delayed packages to their destinations on time. The airport's two biggest airlines, United and Frontier, said they flew full schedules of a combined 1,200 flights Sunday. They had a similar schedule Saturday as travelers around the country whose itineraries were wrecked by the storm raced to get home. Last Christmas Eve, an estimated 129,000 passengers passed through the airport, the nation's fifth-busiest annually, but officials say patterns change from year to year. Airline officials said they had no way of knowing when the backlog of passengers might be cleared because they don't know what decisions the travelers made. "Did they cancel? Did they find another form of transportation to get to their destination? Did they book at another time?" said Frontier spokesman Joe Hodas. United was running nearly on schedule Sunday despite adding the 12 flights to its regular 900 and holding some planes to make sure every seat was filled, spokeswoman Robin Urbanski said. She said many standby passengers were boarding the planes but did not know how many. Leigh Bingham of Denver was waiting to board a flight to Albuquerque, N.M., on Sunday to spend Christmas with her parents and siblings. She said she missed a flight Friday after three hours in the airport's security checkpoint line. "That was the longest line I've ever seen, including for roller coasters," she said. On Sunday, the snaking line was gone and she made it through the checkpoint with plenty of time to spare. "I'm very, very, very happy," she said. Sharon Lewis Koho, 60, of Nampa, Idaho, also expected to leave Sunday after her flight to Boise was canceled Wednesday. On Saturday, she made herself at home on a cot with a blanket and a stack of books. "Welcome to my living room," she said. "I have a bathroom, a drinking fountain," she said, motioning across the terminal. "I've just settled in." Hodas said 75 to 80 workers from Frontier's Denver headquarters went to the airport Saturday to help any way they could. Even chief executive Jeff Potter helped check in passengers at curbside, Hodas said. Crews moved about 4.4 million cubic yards of snow from runways, taxiways, ramps, deicing areas and roadways, airport spokesman Steve Snyder said. More than 3,000 incoming flights alone were canceled or diverted while Denver International was shut down for 45 hours after the storm hit Wednesday. Some passengers left for hotels or gave up and went home, but others stuck it out at the airport. An estimated 4,700 camped out there at the peak of the closure. Runways started reopening at midday Friday, and the last of the six runways reopened Saturday, giving the airport more capacity than airlines needed, Snyder said. 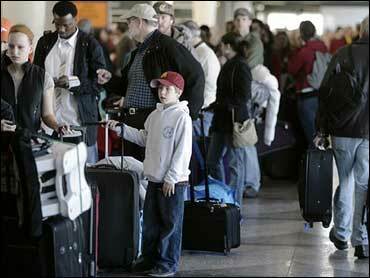 The troubles at Denver backed up flights around the country heading into one of the busiest travel times of the year. The blizzard also disrupted mail service arriving from elsewhere as well as deliveries within Colorado and Wyoming for parts of three days amid the Christmas delivery crunch. On Sunday, an army of 1,500 mail carriers fanned out across the two states, making rare Sunday deliveries in a bid to get hundreds of thousands of blizzard-delayed packages to their destinations on time. "This is an unprecedented effort," Postal Service spokesman Al DeSarro said. They all volunteered for the extra duty, he said. Normally, about 100 carriers would be working on Sunday, he said. "There were flights of packages that didn't get in until Saturday morning," DeSarro said, adding that 300,000 packages arrived at post offices in the two states on Saturday and Sunday. Mail carrier Robin Smith, who was delivering packages in suburban Aurora, said she volunteered for the gratification of helping other people. "I have two little girls, a 10- and a 6-year-old, and they think it's really cool that I'm playing Santa Claus," she said. Smith said one elderly woman was overwhelmed when she knocked on her door and handed her a package. Mail carrier Danny Chavez said some people in Aurora were surprised to see him but others expected it. "They say 'Thank you very much and Merry Christmas' and I say the same to them," he said. DeSarro said about 500 carriers would make deliveries on Christmas Day. "It's going to be a huge load," he said.